If the PHEV is ever to gain broad acceptance in this country, Honda’s Clarity Plug In Hybrid is a good bet to be the catalyst. Pricing for the two trim levels are great and is made even better by the Clarity PHEV’s eligibility for a federal tax credit of up to $7,500. With the base model starting at $34,295 and the Touring at $37,495, most buyers are looking at a sub-$30,000 car even before any state or local perks kick in. It gets an EPA fuel efficiency rating of 47 miles of all-electric range, 42 mpg when its 1.5-liter gasoline engine is running and, per the federal test procedure, can give you 340 miles of range on one fully charged battery and a measly 7 gallons of gas. that makes it one of the most efficient of the more than two dozen plug-in hybrid models in the market. Add a full complement of Honda safety, infotainment and convenience features and Honda’s justifiably respected engineering and build quality, and the Clarity Plug In Hybrid is one heck of a value. The PHEV is one of three members of the Clarity family – its siblings are the all-electric Clarity EV and the Clarity Fuel-Cell, or FCEV, which uses compressed hydrogen to make electricity on board. Of the three, the Clarity Plug In Hybrid is the one that operates most like a standard gasoline-burning sedan, making it the least alien for most people who’ve ever before considered an electrified vehicle. All you have to do to get the best fuel economy is remember to plug in and recharge the 17 kwh battery pack every night. While that battery pack should be recharged whenever it gets close to empty, the Clarity PHEV can run all day on its gas engine, which mostly works as a generator for the electric motor but also can help drive the front wheels when a little extra power is needed. So, if you forget to plug in, or are planning a trip to laces where electrical outlets aren’t handy, the Clarity Plug In Hybrid won’t leave you stranded (unless there aren’t any gas stations, either). The PHEV also is the only member of the Clarity family available in all 50 states, and the only one you can buy or lease. The other versions are lease-only and the EV is available only in California and Oregon while the FCEV is a California-only car. The fuel-cell model’s availability is further limited to the metro areas of the state, where most of the nation’s hydrogen fuel pumps are located. Honda has said it is targeting 75,000 Clarity sales by 2021, with the clarity Plug In Hybrid to be, by far, the volume seller. That’s not great for a conventional model but is outstanding for a PHEV. If shoppers aren’t off-put by the Clarity’s slightly unusual styling and Honda sales people are able to make the argument that a car with a plug can make sense for many, it should be a target easily met. 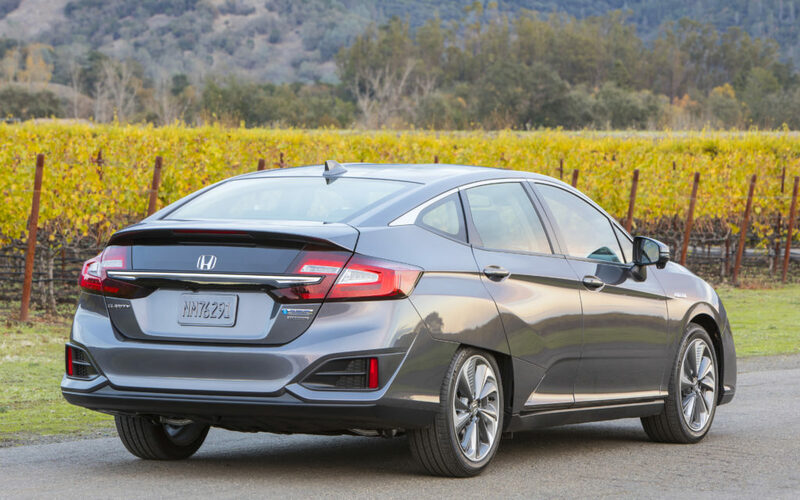 The Honda Clarity Plug In Hybrid is a midsize sedan that feel much larger inside than that designation implies. Honda managed the need to accommodate both a gas engine and a battery pack for the PHEV’s electric drive system quite nicely without sacrificing any of the passenger space. As a bonus, the PHEV’s trunk is the roomiest of the three Clarity models. At 4,052 pounds curb weight, the Clarity PHEV is a tad heavier than the Clarity EV (4,024 lbs.) but tilts the scales almost a c-weight lighter than the Clarity Fuel Cell’s 4,134 lbs. As with all Clarity models, the suspension keeps the PHEV lighter on its feet than its two-tons-plus might suggest. Acceleration is okay but nothing to write home about. As with most electric drive cars the Clarity PHEV is quick on takeoff, but power drops off a bit at higher speeds. 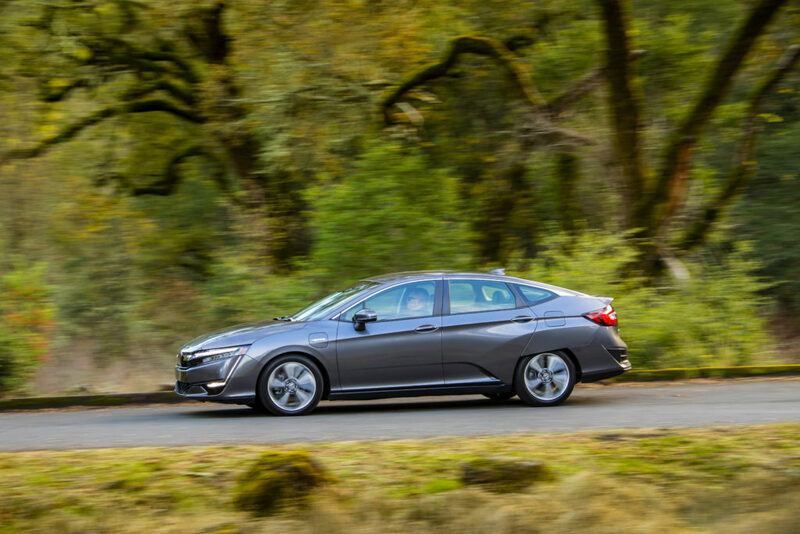 With total system output of 212 horsepower and 232 lb-ft of torque from its electric motor, the Clarity Plug-In Hybrid is a bit quicker at high speed passing and acceleration, though, than its counterparts: the fuel-cell model is rated at 174 hp and 221 lb-ft of torque, while the EV cranks out just 161 ponies and 221 lb-ft.
There’s a bit of body roll when cornering quickly but is not as pronounced as in the FCEV and the suspension keeps the car from bouncing on rough roads. As with its stablemates, the Clarity PHEV’s handling is best described as composed, not sporty. Steering is responsive. The Honda Clarity PHEV is EPA rated at 47 miles of range running in pure EV mode, and 42 mpg combined when the gas engine is engaged (44 mpg city, 40 mpg highway). Mpg-equivalent is 110 miles combining conventional gasoline-electric hybrid operation with the all-electric range. The Clarity Plug In Hybrid’s 7-gallon gas tank is good for 294 miles and if you always start off with a full battery as well as a full tank, the EPA says you can go 340 miles before running dry. that compares very well to the pure EV’s 89 miles of range and the fuel-cell version’s 366 miles. On a recent 611-mile road trip, loaded with two people, their overnight luggage and a perhaps 100 pounds of cargo on the return leg, the Clarity PHEV Touring that Honda loaned TheGreenCarGuy for review purposes returned an average 48.1 mpg. That included 97 miles of all-electric driving from two full charges of the battery pack plus the occasional bonus EV-only session contributed by the car’s impressive regenerative braking system – which generates extra juice from kinetic energy when the Clarity is coasting or braking. The Clarity PHEV offers plenty of room inside for four and can fit five adults comfortably for short trips. The seats are well-padded but lateral support could be a bit better. Head room is impressive up front, but gets a little tight for taller passengers in the back as the roofline slopes down. 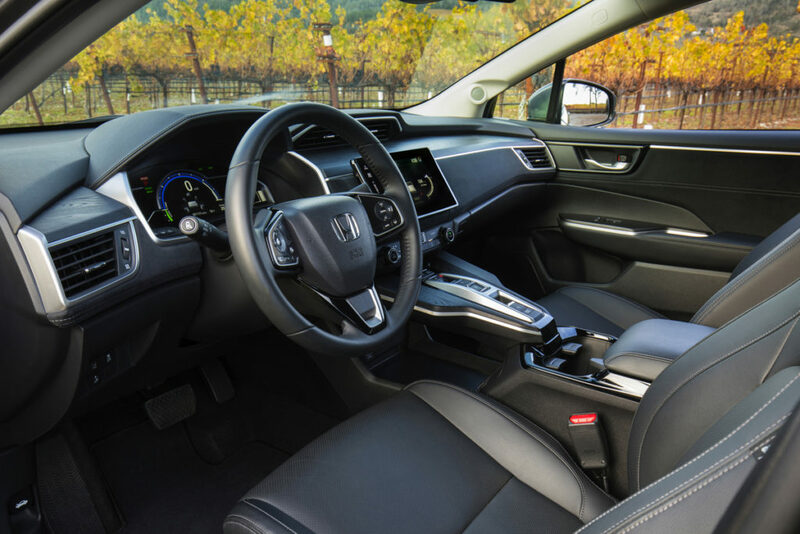 The base Clarity PHEV gets cloth and synthetic leather-trimmed seats, the Touring trim adds power adjustable leather seating and a leather-wrapped steering wheel. Front seats in both trims are heated. The instrument layout is driver-oriented and the switchgear easy to use. The touchscreen seemed a little slow to respond, though, and the layout of the console-mounted gear selector – which requires you to push a button for some functions and pull for others, is awkward and could take a good bit of learning time to get comfortable with. Honda engineers are dab hands at soundproofing, so wind noise is almost nonexistent. But with the audio off there is a bit of road noise when running in all-electric mode. It doesn’t go away but the timbre is changed when the gas engine starts humming. Because that engine is a generator most of the time, it often runs at speeds that have nothing to do with how fast – or slow- you are traveling, another quirk (shared with the Chevrolet Volt) that rewires some adjustment time. The interior borders on luxury-car quality, with a soft touch dash covering that’s almost like suede, and a clean, contemporary instrument panel and dash layout. The wood trim is plastic, but it looks pretty realistic. 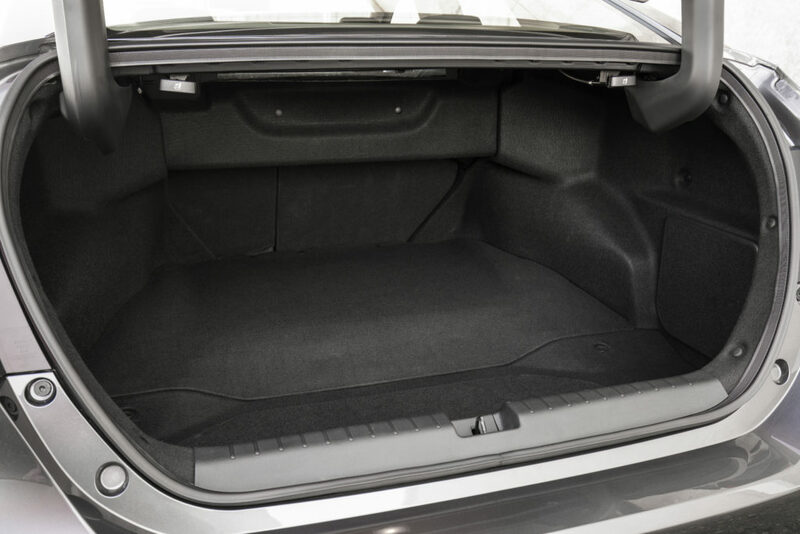 There’s plenty of cargo space – the Clarity Plug In Hybrid has the largest trunk in the family, 15.5 cubic feet versus 14.3 cu-ft for the EV and just 11.8 cubes for the FCEV model. 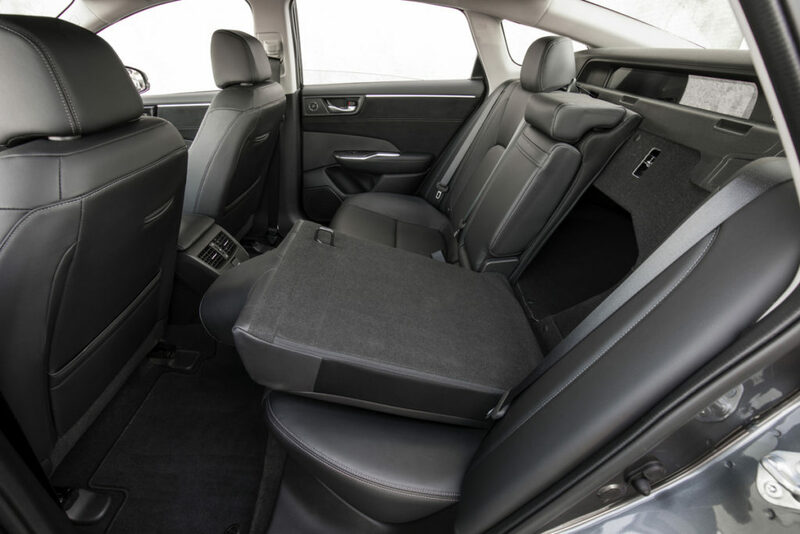 The PHEV’s folding, 60/40 split rear seats help with extra cargo or when carrying lengthy objects. The Clarity PHEV, like its siblings, is loaded with driver assist technology (the backbone of self-driving capability in future models) including adaptive cruise control, lane keeping assist, forward collision mitigation, stability and traction control and blind spot monitoring via the Honda LaneWatch system that displays a view of the passenger-side roadway on the navigation screen. Honda also provides voice control for the Touring trim’s infotainment system (phone, navigation and audio) or you can skip that and simply use your smartphone’s voice system – presuming you pair it first. Honda’s “acoustic vehicle alerting system,” provides an audible warning that sounds when idling or running in EV mode at low speeds in order to alert pedestrians to the nearly silent cars’ presence. The Clarity PHEVs come with eight-speaker, 180-watt audio systems with 8-inch touchscreen displays. All have Bluetooth connectivity and Sirius satellite radio and Apple CarPlay and Android Auto capability. The PHEV Touring trim adds voice recognition and satellite-based navigation with turn-by-turn directions. With a few differentiating tweaks, all versions of the Honda Clarity share the same exterior. It is one that looks to have been inspired by the Transformers and Imperial cruisers the current generation of auto designers grew up with. Lots of vents and scoops and creased metal surfaces. The spokes in the standard 18-inch alloy wheels (a different design for each model) look like saw-toothed turbine blades. The rear wheels are partly -covered by the Clarity’s sheet metal. That’s to improve aerodynamics. The look grows on you, but takes some getting used to. Unlike its siblings, the Clarity PHEV uses a gasoline engine to augment its electric drive system. A 1.5-liter, 103-horsepower four cylinder engine that serves primarily as a generator. The power control computer will keep things running smoothly, deciding when and for who long the engine needs to run to help charge the battery on the fly or to add a bit of mechanical boost to the electric power when extra oomph is needed. The Clarity can hit close to 100 mph in all-electric mode, but you can’t stomp on the accelerator to get there, you have to creep up on it lest the gas engine kick in. But Honda also likes to let drivers control things, so the Clarity Plug In Hybrid has a multitude of driver-selectable modes. To top things off, there also three modes – or strategies – for battery use. The Clarity PHEV normally runs on battery-electric power until the battery is nearly depleted, or unless you floor it, which automatically brings the gas engine into play. In the Sport mode, the Clarity Plug In acts like a normal hybrid, with engine and electric motor working together. And there’s a button market “HV” which Honda says is best used on long highway drives. A short push of the button turns things over to the power management computer to keep things running in the most fuel-efficient manner conditions allow. A longer push triggers a battery replenishment mode, in which both electric and engine power are used, but the engine power is redirected into generating electricity to charge the battery whenever possible. In this mode, you can add up to 27 miles of all-electric range to the battery while tooling along the highway, saving it for use when you hit town and want to run in a quieter, non-emissions mode. In our test drive, we tried it on a long mountain road and gained 20 miles of EV range in 28.1 miles of driving. 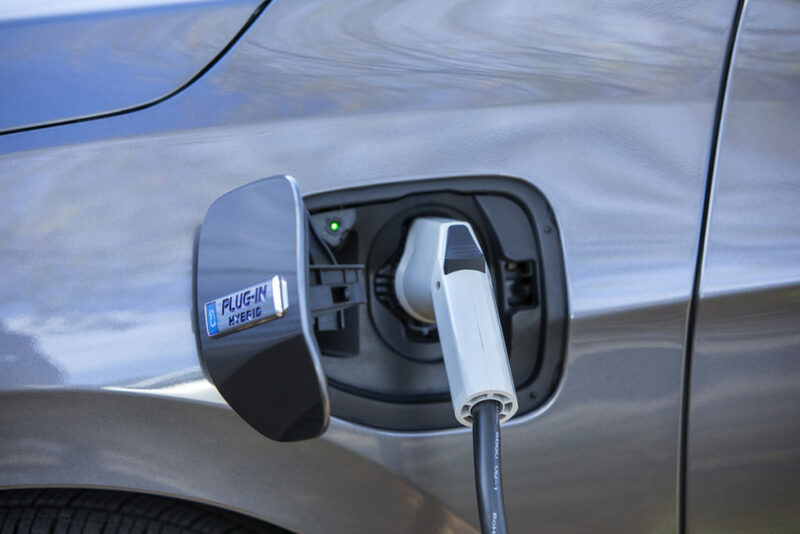 The Clarity Plug In Hybrid has a 17 kWh, lithium-ion battery pack that can be charged in about 3.5 hours from a Level 2, 240-volt system or 12 hours from a 120-volt standard wall plug. Like almost all other PHEVs (the 2018 Mitsubishi Outlander Plug In is the exception), the Clarity Plug in doesn’t have rapid charging capability for quick on-the-road top ups. There are loads of reasons why electrified vehicles are the future, and lots of arguments for why they aren’t yet perfect. The Clarity Plug In Hybrid won’t be for you if rocket-like acceleration, sports-car handling and SUV utility top your must-have list, or if you don’t have access to a plug at home or simply can’t be bothered to take the 30 seconds needed to plug it in each night. But for those seeking clean, quiet, roomy, fuel-efficient, ultra-low emissions transportation that’s loaded with luxury and safety goodies for a relatively low after-incentive price, the Clarity Plug In Hybrid is a great deal. 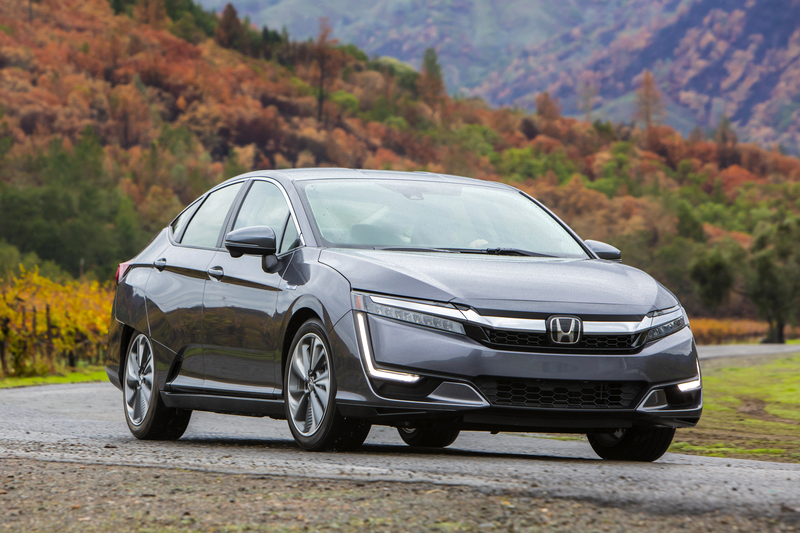 Next: Read TheGreenCarGuy’s Honda Clarity EV and Fuel-Cell first-drive review.